"Together, these three musicians both rediscover previous relationships and reveal unexplored synergies among a wide scope of ethnically diverse music. A classically trained double bassist, Vitold Rek got the jazz bug as a teenager in Poland when he first heard the unrivaled bass mastery of the great Ray Brown. Jazz explorations followed and in the ensuing years trumpeter Tomasz Stańko tapped Rek to become his bassist. Today, Vitold Rek is a significant voice on the world jazz stage with a singular sound that is a distinctive blend of musical sensibility and startling technique. This has resulted in some of the finest bass led performances in modern jazz with legends such as pianist Karl Berger, the saxophonists Charlie Mariano and John Tchicai as well as the late trombone player Albert Mangelsdorff. On "Home", Rek also reveals his mastery of the mandolin, featuring it side by side with his incredible bass playing. In the process, he is able to call up Polish, Greek, Scottish and Jewish coloration to facilitate a broad group sound. Among the many world music idioms that have been interwoven into Rek's music is klezmer, the Jewish folk music of Eastern Europe, whose delicate modes and forms have seen a recent resurgence in their combination with modern jazz. 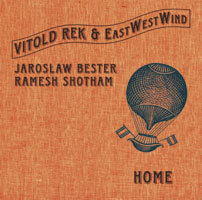 For EastWestWind's second member, Rek has called upon someone who himself is no stranger to groundbreaking projects, Polish accordionist Jarosław Bester a player whose adventurous energetic spirit is combined with a peerless mastery of chordal and melodic shadings, Bester is the perfect soulmate to impart Rek's musical ideas. Exponentially extending the reach of this remarkable trio is percussionist Ramesh Shotham who brings his large array of traditional Indian instruments. Equally comfortable in the three worlds of jazz, rock and classical South Indian music, he can both follow Rek's lead and propel these tunes in interesting new rhythmical and melodic directions."